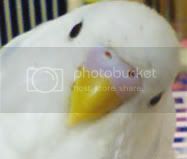 "Puck, a budgerigar, or budgie (popularly known as a parakeet in America), was accepted into the 1995 Guinness Book of World Records as "the bird with the largest vocabulary in the world." He was acknowledged as having 1,728 words when the Guinness Book went to press. The documentation for his feat took place over a six-month period when 21 volunteer observers in 21 separate sessions took notes on what they heard Puck say. Several observers were members of the Redwood Empire Cage Bird Club (Sonoma County, California), and most were familiar with various species of parrots. Two of the volunteers were avian veterinarians. In addition to the volunteer observations, tape recordings and a video were provided as documentation for Guinness. Puck's owner/caregiver, Camille Jordan, of Petaluma, California has about 30 hours of Puck tape recordings, videos and detailed records of every word she heard spoken! Puck appeared on several Bay Area newscasts in December 1991 after an article was written about him in American Cage-Bird Magazine. Another article about Puck appeared in Bird World (Vol. 15, No. 6, 1994). Rather than just mimicking, Puck created his own phrases and sentences. He often used the appropriate phrase in a situation, and sometimes displayed an uncanny understanding of his environment. For example, on Christmas morning, 1993 Puck was entertaining himself on the coffee table in the living room when Camille and her husband heard him say: "It's Christmas. That's what's happening. That's what it's all about. I love Pucky. I love everyone." Unfortunately, Puck's life was too brief. He was only five years old when he died of a gonadal tumor on August 25th, 1994(rip). He had been accepted into the Guinness Book only a few months earlier. Puck appeared in the 1995 through 1998 Guinness Books, was omitted from the 1999 through 2002 editions and reappeared in the 2003 and 2004 editions. The 2005 paperback Guinness Book has not been released at the time of this writing. Readers should note that recordholders will not necessarily appear in every Guinness Book!" 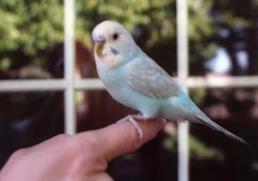 I have been around budgies since I was eight years old. I want to show the world how amazing these little creatures are, because most people underestimate them. 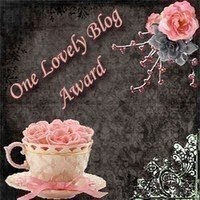 I learn a lot by observation and research and I am proud to see this blog improving every day. A big thank you to my followers and all the people who leave comments, it means a lot! I also want to thank my husband, who came up with the wonderful idea of starting this budgie blog.